Garlock Sealing Technologies, LLC. 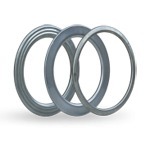 designs, manufactures, and sells fluid sealing products for processing industries. The company offers compression packing, including valve stem packing and dry-running self-adjusting pump packing sets; gasketing; anti-stick gasket coatings; and hydraulic components, which comprise heavy-duty seals, V-ring packing, urethane seals, vertical sludge pumps packing, polytop sets, and turbine runner blade packing. It also provides oil seals; bearing isolators; mechanical seals, including lip, shaft, component, and cartridge seals; metal gaskets; and critical-service flange gaskets. The Garlock family of companies is acknowledged as the global leader in high-performance fluid sealing and pipeline protection products for industry and infrastructure. Garlock products are at work in many specialty industries, including chemical and petrochemical, refining, pulp and paper, water and wastewater treatment and drainage, power generation, primary metals, food and pharmaceuticals, infrastructure, mining and others.